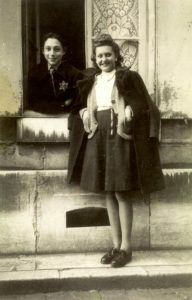 This exhibit on display throughout the Spring 2018 semester on the first floor of Walsh Library is designed to share the historical significance of remembering the Holocaust and have furthered the discussion of inter-religious dialogue and cooperation over the last century into the new millennium. This select array of materials on display also provides an introductory and research-oriented means of appreciating the power of individual and communal stories through the sharing of documentary evidence. The Jeifa Family Collection is based mainly on the contributions of Mr. Michel Jeifa (b. 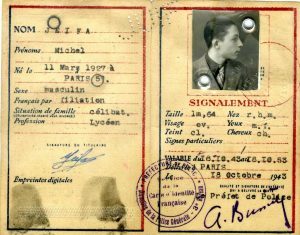 1927) who was born and raised Paris, France and surviving the Holocaust and being able to endure after the deaths of his parents in concentration camps during World War II. Various representations of life before and after this tragedy along with symbols and pride in their faith have been preserved by Michel, his children, and grandchildren as part of an important and lasting legacy. 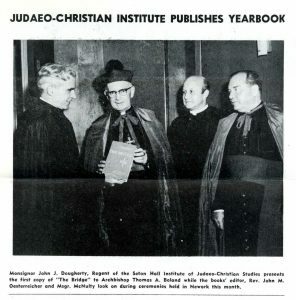 The materials presented here were selected from various portions of the Archives & Special Collections Center at Seton Hall University with editorial assistance from Reverend Lawrence Frizzell, Director and Associate Professor of the Jewish-Christian Studies Graduate Program, and Ms. Gisele Joachim, Dean of Enrollment Management of the Seton Hall University School of Law. 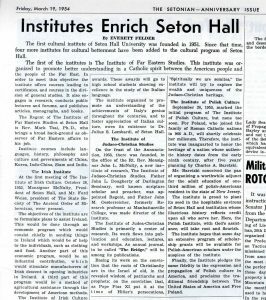 For more information on this exhibit and other materials related to the Holocaust and Judaeo-Christian Studies, please contact Alan Delozier, University Archivist via e-mail at:<Alan.Delozier@shu.edu> or phone: (973) 275-2378.